Given the choice between my LAN (wired) and my WiFi connections, my Windows 7 PC gives priority to the WiFi - how can I make it prioritize the LAN connection? Press alt to make the menus visible, select Advanced Settings... from the Advanced menu. Reorder the items in Connections so that you Local Area Connection is on top. You'll want to set the Metrics on each adapter. This way your LAN is listed first on the routing table. The binding above will affect DNS queries, but you'll also want your routing table to choose the LAN's gateway first, before the Wifi's gateway. Here is the relevant Microsoft technet article. edit might as well cut and paste the instructions in case you can't find em. You can change the interface metric on a network adapter if you are using TCP/IP as a transport protocol because TCP/IP uses the interface metric to determine the order. You can change the interface metric to make one network adapter more favorable for all TCP/IP connections. The interface metric (IPConnectionMetric) for a network connection indicates the cost of using the routes in the IP routing table. The routes are derived from the interface configuration. The cost becomes the value in the Metric column for those routes in the IP routing table. If there are multiple routes that are a close match for the route to a destination in the IP routing table, the route that has the lowest metric is used. The range of valid values is 1 through 9999. To view the IP routing table, type route print at the command prompt. For more information about the Automatic Metric feature that is used in Windows XP for IP routes, click the following article number to view the article in the Microsoft Knowledge Base: 299540 An explanation of the Automatic Metric feature for Internet Protocol routes To change the interface metric, follow these steps: Click Start, click Run, type ncpa.cpl , and then click OK. 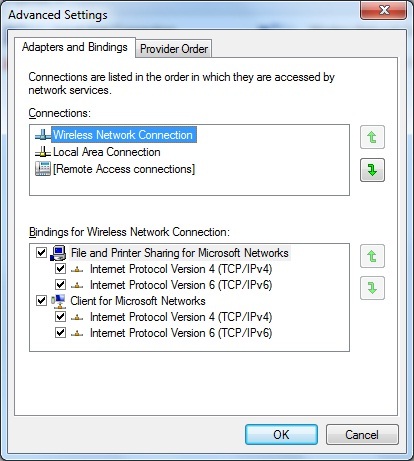 The available connections appear in the LAN and High-Speed Internet section of the Network Connections window. Right-click the network adapter that you want to change, click Properties, and then click the General tab. In the This connection uses the following items box, select Internet Protocol (TCP/IP). Then, click Properties. In the Internet Protocol (TCP/IP) Properties dialog box, click the General tab, and then click Advanced. On the IP Settings tab, click to clear the Automatic metric check box. Then, type a value in the Interface metric box. Not the answer you're looking for? Browse other questions tagged windows-7 networking wireless-networking lan priority or ask your own question.